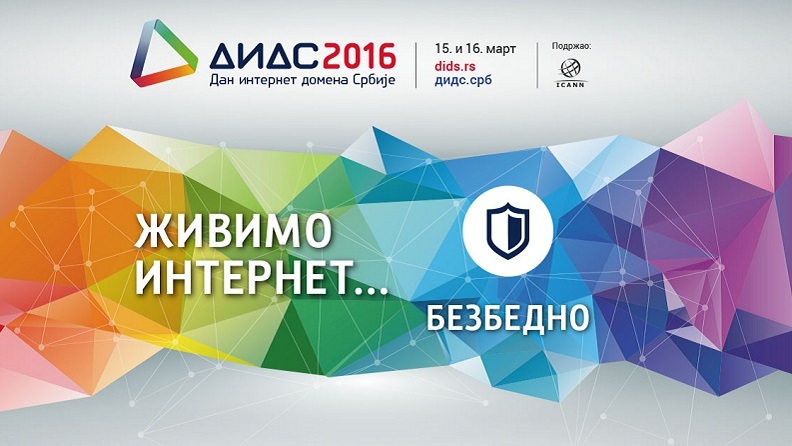 The seventh Internet conference, DIDS 2016, to be held 15th and 16th March, at the Hyatt Regency Belgrade hotel, under the slogan Living the Internet: Globally – Securely – Locally , organised by the Serbian National Internet Domain Registry Foundation (RNIDS). The second block of the DIDS 2016 Internet conference, titled Securely, will be devoted to current issues of security on the Internet, with moderation by Slobodan Marković, ICT Policies and Internet Community Relations Advisor at RNIDS. This block concerns the plans for the implementation of the newly-passed Law on Information Security, which envisages the establishment of CERTs – Centres for the Prevention of Security Risks in ICT Systems. The experiences of similar organisations in the region will be considered, as well as the changes that have taken place in the area of Internet security in the last few years. A panel discussion will be joined by Gorazd Božič from Slovenia, director of SI-CERT, Filip Vlašić from Croatia, computer security specialist of HR-CERT, Sava Savić, Deputy Minister in the Ministry of Trade, Tourism and Telecommunications, Nebojša Jokić, Chief of the Interior Ministry CERT and Dušan Stojičević, member of the SEEDIG Executive Committee. This year too, DIDS is free of charge to all participants who have (due to the limited number of spaces) registered at dids.rs.